- 1) RICERCA DEI DOCUMENTI ORIGINALI CHE TRATTAVANO DELL'ASSEDIO DI CANELLI E DELLA «GUERRA PER LA SUCCESSIONE DEL MONFERRATO. AGGIUNTE NOTIZIE UTILI PER LO STUDIO DELL'ASSETTO URBANISTICO DELLA CANELLI DEL 1613. SULLA SCORTA DI QUESTE NOTIZIE È STATO POSSIBILE REALIZZARE IL «DISSEGNO VERO DELLA TERRA E LUOCO DI CANELLI AL TEMPO DELL'ASSEDIO». COSTUMI ABBIAMO EVIDENZIATO UN QUADRO DI POVERTÀ E MISERIA DIFFUSO IN TUTTO IL PIEMONTE, IN PARTICOLARE CANELLI, CHE ERA UNA FORTIFICAZIONE POSTA AL CONFINE DI STATO DI SAVOIA, SI TROVAVA IN CONDIZIONI CRITICHE ED HA PAGATO UN PREZZO MOLTO ALTO ALLA GUERRA PER LA SUCCESSIONE DEL MONFERRATO. SEMPRE DA QUESTA RICERCA SI È AVUTA ULTERIORE CONFERMA SULLA VOCAZIONE VINICOLA CANELLESE E SULLA QUALITÀ DEI SUOI "MOSCATELLI"
DOCUMENTS PRODUCED BY THE TWO FIGHTINIG PARTIES. WE HAVE OBTAINED VERY IMPORTANT INFORMATION FOR THE ORGANIZATION OF THE MANIFESTATION, WE HAVE TO ADD OTHER USEFUL NEWS FOR THE ANALYSIS OF THE TOWN PLANNING DISPOSITION OF CANELLI IN 1613. 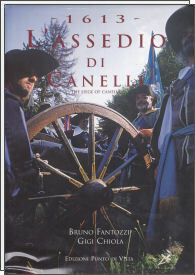 THANKS TO THESE INFORMATION WE COULD REALIZE THE PLAN OF CANELLI AT THE AGE OF THE SIEGE . FOUND POVERTY ALL OVER PIEDMONT, IN PARTICULAR CANELLI WHICH WAS A FORTIFICATION PLACED ON THE BORDERS OF SAVOY'S STATES HAD CRITICAL CONDITIONS AND PAID THE HIGHEST PRICE IN THE WAR FOR THE SUCCESSION OF MONFERRATO. FROM THIS RESEARCH WE HAVE HAD A FURTHER CONFIRMATION OF THE WINE VOCATION OF CANELLI AND OF THE QUALITY OF ITS "MOSCATELLI".